So my recent efforts to catch up on reviews for the various DC Universe Animated Original Movies also resulted in a weird discovery - movies that we had missed. Despite my efforts to faithfully watch these movies as they come out, it turned out that I was less than perfect in such efforts. And for one reason or another, this was the movie we missed. 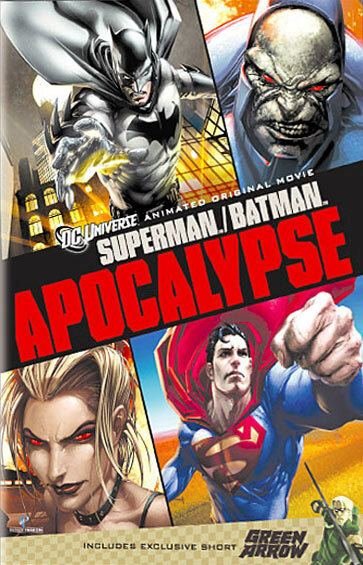 Superman/Batman: Apocalypse is sort of a follow-up to Superman/Batman: Public Enemies, given they both share a single comic book series as source material. But oddly enough the title didn't quite capture what the full gist of the story would actually turn out to be. Ugh, that last sentence felt less than ideal. Moving on. What I meant to say is that this story actually featured a heck of a lot of Kara Zor-El, better known as Supergirl, more than most else. And while Superman and Batman are certainly physically present in this story, it didn't really feel like they were the central characters. You could argue it was almost a Justice League style ensemble given Wonder Woman's participation, but in the end it was a little short on delivery. Synopsis: Superman/Batman: Apocalypse is a direct-to-video animated movie directed by Lauren Montgomery with a screenplay by Tab Murphy. The story was still based on a Superman/Batman story, this being "The Supergirl from Krypton". It has been less than a month since the events in Superman/Batman: Public Enemies and the world is still talking about the impeachment of President Lex Luthor as a meteor lands in Gotham City Harbor. From within the rock emerges a female speaking an alien language and seemingly possessing powers similar to Superman. Batman (Kevin Conroy) eventually subdues her with a Kryptonite fragment and eventually Superman (Tim Daly) helps determine the girl's identity - she is in fact his cousin, Kara Zor-El (Summer Glau). Initially Superman does his best to help her integrate into life on Earth by teaching her to speak English and local customs like shopping and eating junkfood. But eventually she is attacked by a group of Amazons led by Wonder Woman (Susan Eisenberg). They insist that the best thing to do is to have her train to use her powers properly on the Amazon island of Themyscira. At the same time, we learn that Darkseid (Andre Braugher) is searching for a new individual to lead his Female Furies given the departure of Big Barda (Julianne Grossman). And the news of Kara's arrival on Earth seems to have come just at the right time. First, it's always a bit of a delight to have Tom Daly and Kevin Conroy voicing Superman and Batman respectively. These are two highly distinct voices that have truly given life to these characters as part of the efforts of Bruce Timm when it comes to the DC Animated Universe. They have really grown into these characters and it's rather hard to accept anyone else filling in those shoes. But given that, it was sort of a shame that they opted to feature this story compared to any of the other Superman/Batman stories. For one reason or another, this story actually didn't have as much dialog as hoped for these two characters, and hardly any of that dialog being banter between them. And nothing quite defined the Superman/Batman experience more than having the two constant taking verbal potshots at one another given their different views on how things should be handled. Summar Glau was okay as Supergirl, I suppose, but the character in itself felt a little shallow here. Sure she had just arrived on Earth and all, but we had some weird narrative jumps that were just hard to accept. And why was she such close friends with the Amazonian Lyla (Rachel Quaintance)? I know about two months had passed, but a bit more context would have been nice. And that's sort of indicative of one of the problems with this cartoon. It certainly had its fun moments but it didn't quite flow smoothly from sequence to sequence. This jerkiness in narrative and some of the quirks in the dialog (and the lack thereof) sort of left the movie feeling somewhat hollow. And it really didn't help that Andre Braugher made for a rather strange Darkseid. In a post-Brooklyn Nine-Nine universe, it's really hard to take that voice seriously as the voice of this dark god. To be fair, the animation was still pretty excellent and a lot of the fight scenes were fairly well-choreographed. Special points to Big Barda's scenes - she's clearly a bit of a favorite in the animation department. Or something like that. Superman/Batman: Apocalypse was a decent enough addition to the DC movie universe, but not a great one. I think they could have repackaged this as a different story or perhaps just gone in a different direction. Thus the animated feature gets 3 moments of Supergirl being a little over her head out of a possible 5.